We know readers tend to be writers too, so twice a month, we’ll feature writing tips from our authors. Who better to offer advice, insight, and inspiration than the authors you admire? They’ll answer several questions about their work, share their go-to techniques and more. Now, get writing! Write a s***ty first draft. If I could give you only one piece of advice, it would be this. I didn’t make up—I heard it from Anne Lamott— thanks, Anne! Anne Lamott didn’t make it up either. Every writer since the beginning of time has written some god-awful, hideous nonsense at one time or another. I write straight through to the end of a book without once looking back. Not everyone does it this way— some people edit as they go. But for me, this is a great way to get out from under your own self-judgment. Sometimes I barely even punctuate my first drafts. I like to soft focus my eyes and write as if in a trance, going on tangents, allowing the most treacly sentimentality and absurd hyperbole. I breathe and write and try to open my mind to the click, the spark, the flow. I soldier on this way until The End. By that time I usually have some idea of what my book is about. It’s never what I thought when I started. Move around. Take a walk. Stretch. Breathe. Don’t live in your head so much that you forget your body. The body is one of our greatest recording devices– a goldmine of wisdom, memory and emotion. It digests and assimilates our thoughts and experiences, taking on a perspective that is often wiser than our intellect, and more accurate. There is no secret. I know you don’t want to hear “write badly” and “take a walk.” Usually what people ask for is my schedule (here it is: mornings, at least four hours a day, five days a week), a template for the perfect outline, a recommendation to the magic graduate school, a shortcut, an agent introduction, a way to make it not hurt so much. I often talk to people who are “stuck” with their memoirs, and watch their face fall when I ask them, “Have you thought about writing it straight through to the end and not looking back?” They usually have a million reasons why they can’t or shouldn’t do that. And maybe they shouldn’t. I don’t know what they need. But I do know three over-edited chapters won’t magically transform into a book one night while you’re sleeping. Writers are readers. We have grown up treasuring the books we devoured late at night, by the light of a stolen flashlight. We dreamed one day we’d be the name on the cover of just such a precious object. That may or may not happen, but either way it’s a worthy quest. It’s so easy to forget, while caught up in the morass of self-doubt and self-pity that can swamp our fragile writer souls, that this life of struggle is a dream come true. I love it fiercely. I hope I get to keep doing it until the day I die. 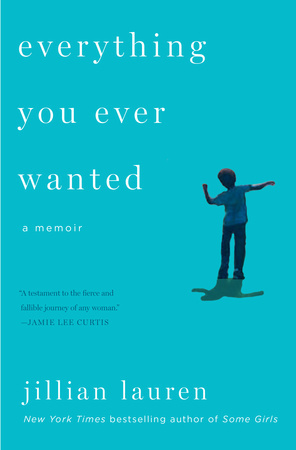 Read more about Jillian Lauren’s book, Everything You Ever Wanted here.